Salary: As per industry standards and aspirations of the right candidate. Age no bar: Fresh College Graduates can also apply. Marital Status: Not a concern. Job Description: The person shall be responsible for working on sales and marketing initiative and strategies through digital media and traditional ways of marketing. – Good communication & written skills in English. – Must be a graduate. – An interest in photography and visual arts will be a plus. – Honest, Diligent and hard-working. – Anyone who thinks they fit the above requirement can apply. – People with a background in Mass Media, Hotel Management, Assistant Directors in Films and Television will find the job role as per their skill set, however, don’t hold-back yourself, if you think you are smart, good at communication and you can run activities and manage multiple things. Job Description: The person shall be trained in all aspects of photography and post/pre-production work. 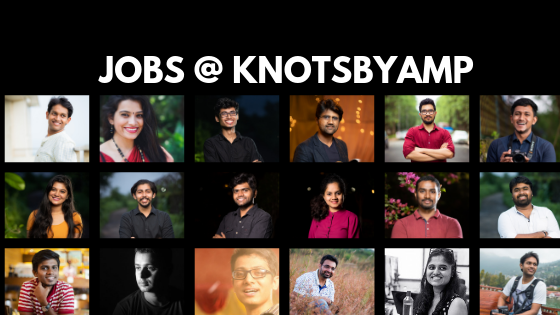 At the end of successful completion of the internship program, the candidate will be considered for full-time position at KnotsbyAMP. – Must have completed +2 examination. – People with a keen interest in photography can apply. Ideal candidates are those who are looking to work with a great photography firm and make a career in photography. – People still pursuing education shouldn’t apply. Job Description: The person shall be trained in all aspects of cinematography and post/pre-production work. At the end of successful completion of the internship program, the candidate will be considered for full-time position at KnotsbyAMP. – People with a keen interest in film-making can apply. Ideal candidates are those who are looking to work with a great photography firm and make a career in photography. Job Description: The person shall be responsible for pre-post production work in Photo & Video-editing. – Adobe Lightroom, Premier-Pro and Adobe PhotoShop. You can join us an intern. Kindly send in your resume at mail@knotsbyamp.com. If you are a good fit we will get back to you. Im currently working with viniyard films, for the upcoming movie ‘Chopsticks’. I want to apply for a job at your place.